The type of tourism pushed by Queensland Events is great for the coast. You cannot help but notice how many athletes use and enjoy the Spit in preparation for the ITU World Championship on the Gold Coast. Stop for a moment and think about a similar event staged in a shipping terminal or polluted port or marina. The images beamed around the world many from the air showed some classic winter - spring weather and is perfect for an international sporting event. Consider the environmental footprint of the event. The new Broadwater Development had good quality infrastructure to handle power and the numbers of people cheering on the athletes and the event itself without shutting down the city. OK there was some issues with traffic but very little rubbish or damage to property compared to other events being pushed on the Gold Coast. Keep our environment clean - enough to stage world class water sports without major long term damage to our home is a bonus. Many local accommodation and cafes reported great business. Check Gold Coast Health and Fitness for images, audio and video of the event. Local triathletes including Brad Kahlefdt have long supported the Save Our Spit campaign. 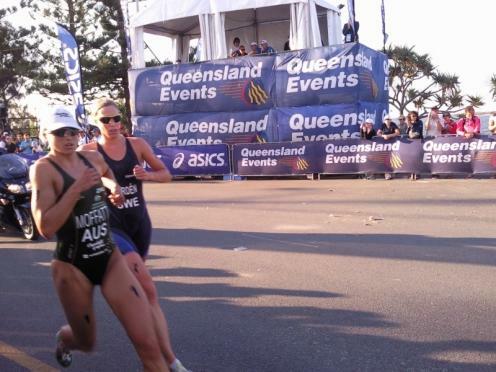 As a bonus Emma Moffat (see picture) out ran Sweden's Lisa Norden in an exciting finish to claim another world triathlon champion for the Gold Coast all within view of the Spit.